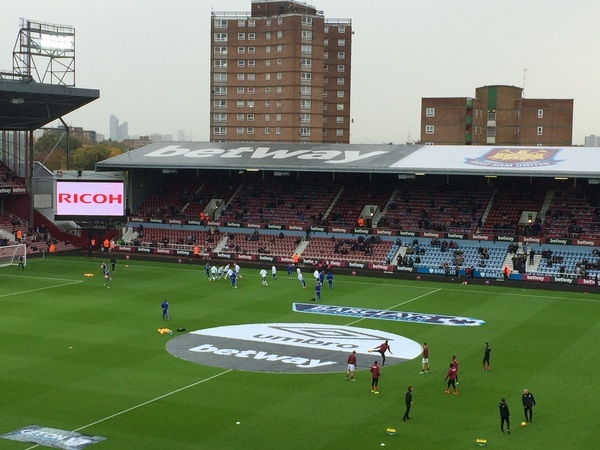 Welcome to Standard Sport's live coverage of West Ham's London derby clash with champions Chelsea from Upton Park! We'll be providing live updates from the Boleyn Ground from 2pm today, but if you want to know more about the huge game today, read our in-depth preview right here! We've arrived at a rainy Upton Park - and team news is coming shortly! So before we announce the starting XI's to play in the London derby today, check out our video preview of how close this derby - the 53rd between West Ham and Chelsea - will be! Aside from being the 53rd London derby, it will also be the last time the two clubs play each other at Upton Park, with the Hammers moving to the Olympic Park next season. So the teams are out! And Slaven Bilic makes just one change to his starting XI to play Chelsea at Upton Park on Saturday after bringing in Mauro Zarate for the ineligible Victor Moses. Of course, the on-loan Chelsea winger can't play today against his parent club but the other piece of news from that line-up is that James Collins partners James Tomkins once again in central defence. And, despite admitting he could start Enner Valencia, who has been out injured, against the champions, Bilic has opted to stick with Diafra Sakho up front in attack. Meanwhile, Mourinho has named an unnchaged XI to face fourth-placed West Ham, with Kurt Zouma keeping his place in the unfamiliar position of right-back following Branislav Ivanovic's injury, which he sustained during the recent international break. Ramires and Nemanja Matic pair up in central midfield while Eden Hazard - left out of Chelsea's starting team that beat Aston Villa last weekend - plays at the Boleyn Ground. The home side come into the London derby today in good shape after beating Crystal Palace - another derby win - at Selhurst Park last weekend. The win meant West Ham have now gone to four tough teams - Arsenal, Liverpool, Manchester City and Palace - and beaten them. Impressive stuff. However, the Hammers' home form hasn't been as great as they've only secured just one win at Upton Park this season - a 2-0 win over Newcastle. Bilic and his men will be aiming to change that today against a Chelsea side who have won just one match away from home this term. As for Jose Mourinho's side, they've looked like a much-improved team in the past seven days. After beating Aston Villa 2-0 at Stamford Bridge last Saturday, Chelsea were much more defensively solid - and better offensively too - against Dynamo Kiev in the Champions League. They may not have gotten a win in the Ukrainian capital - securing a goalless away draw - but Mourinho seems to be happy with the team that played in the Champions League as he's gone with the same XI today. - John Terry makes his 450th Premier League start today against West Ham. While Chelsea's on-field troubles this term are well known, Blues boss Mourinho has hit the headlines off it after hitting back at two teenagers he says "followed and filmed him for 20 minutes last Sunday". Read more about that story, here. 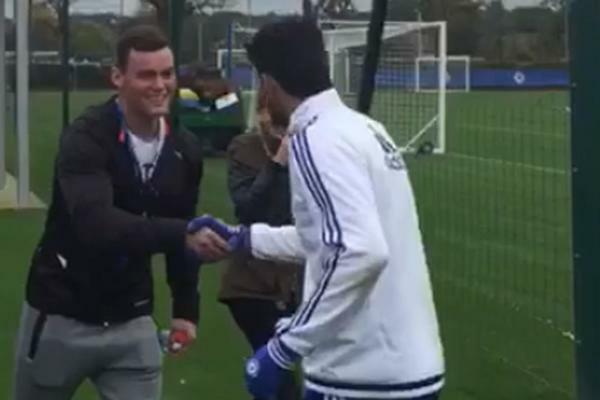 In more uplifting news for the club, the South Africa rugby team paid a visit to Cobham on Thursday to meet some of Chelsea's players. While the Blues try and win the London derby, the Springboks will be aiming to try and beat New Zealand in their World Cup semi-final clash at Twickenham at 4pm. A juicy day of sport, eh? What about West Ham then? Well, the build-up to today's match has been dominated by Dimitri Payet - who has enjoyed a superb beginning to life in the Premier League since his summer move from Marseille. Hammers goalkeeper Adrian has said the France international has brought "magic" to the club after scoring five goals and creating 35 key passes this season. Those stats have made him the most creative player in Europe. But will he have an impact today? We'll find out in less than five minutes! The teams are out and the atmosphere here at Upton Park is amazing! The home fans are really looking forward to this game! The adorable West Ham mascots have all just taken a team photo and have made their way off the pitch. We'll have kick-off in a few seconds! 1min: Chelsea get a free-kick after Willian's fine run is stopped in its tracks by Lanzini. The referee has just spoken to the summer signing before the Blues take a short free-kick. Payet is limping after being brought down by Zouma, who of course is filling in for Ivanovic at right back, but the West Ham winger is back up and looks OK.
4mins: Payet wins possession in midfield before going for goal, although his shot goes well high of the bar. Both teams are slowly settling into this game, but Chelsea have seen more of the ball so far. It might be Terry's special day, but the West Ham fans seemingly don't care - they've just booed the Chelsea skipper very, very loudly. 7mins: Lanzini plays in Payet, but he's offside. 8mins: Fabregas' chipped ball flies over the West Ham defence before Costa drives his resulting shot high. That was the visitors' first chance of the game. Kouyate superbly wins possession in midfield before a series of short passes ends in West Ham getting a corner. Payet drives a shot into the box but it''s cleared by the Chelsea defence. Chelsea go down the other end through Willian, but the Brazilian's pass from the right flank is dealt with by Collins. I have to say, the West Ham fans are really living every moment of this game - from cries of "Oooh" to "Yeahhh". 13mins: Chelsea have a corner after his shot is taken out of play by Tomkins. 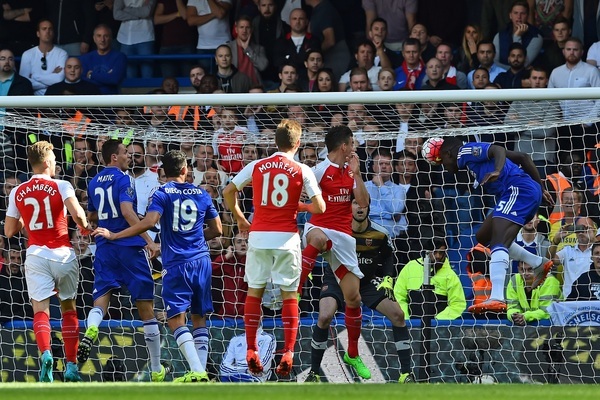 Willian whips in his shot but Costa's header goes wide. Lanzini bullies Fabregas off the ball before West Ham get a free-kick, which Payet fires at goal - forcing Begovic into a save! 15mins: GOAL! ZARATE gives West Ham the lead! The home side have taken the lead following a corner kick that deflected off Fabregas and into the path of Zarate at the other end, who was completely unmarked and needed only to drive a low shot past Begovic. 17: It was @dimpayet17 who took the corner, which a Chelsea defender tried to clear but could only slice to @mau_zeta, who did the rest! 23mins: Azpilicueta is shown a yellow card for his foul on Jenkinson. The left-back has had a lot of work to do so far. 24mins: Chelsea string together a few passes before the ball falls to Ramires, only for the Brazilian to fire a speculative shot high. That was never going to trouble Adrian. 28mins: The pace of the game has slowed down considerably since Zarate scored, with Chelsea trying to patiently try and create some chances - although they aren't having a good time doing that in front of a solid West Ham defence. Having said that, Fabregas' quick free kick flies across the pitch before Jenkinson heads the ball into Adrian's path but it goes out for a corner. The West Ham goalkeeper then makes a one-handed, acrobatic save to clear the resulting corner kick.